Combine ingredients, softening if necessary. 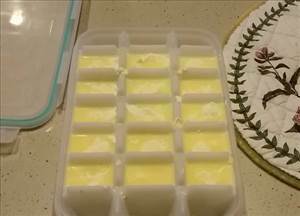 Divide into portions in an ice tray. Freeze for about 4 hours or until set. Should be kept frozen. 206 members have added this recipe to their cookbook. Sorry but could not eat this! To much Cream Cheese and don't like the taste. There are 72 calories in 1 serving of Lemon Cheesecake Fat Bbombs. Calorie Breakdown: 95% fat, 2% carbs, 3% prot.